March Americana | Skinner Inc.
A portrait miniature in watercolor and gouache on paper, (Lot 47, $15,000-25,000) is executed, signed, and dated 1798 by Charles Balthazar Julien Fevret de St. Memin. The artist and the first president crossed paths in Philadelphia in 1798, and this profile portrait of General Washington is almost undoubtedly a product of that meeting. 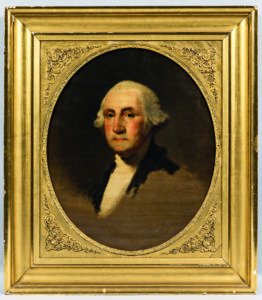 Interestingly, St. Memin is generally credited with completing the last portrait of Washington from life – a work whose whereabouts are reported as unknown. 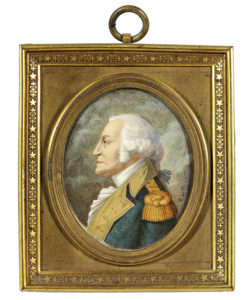 This miniature has descended quietly in the family of Revolutionary War officer Jacob Morgan. 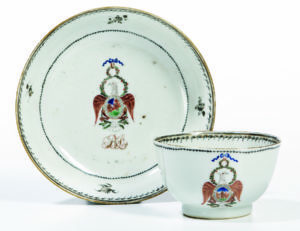 Other items include a teacup and saucer (Lot 45, Estimate: $10,000-15,000) made in China circa 1790 as part of an extensive service for export to Benjamin Lincoln, a founding member of the Society of the Cincinnati (the society’s crest appears centrally located on both), and a Major General involved in three significant British surrenders, including as George Washington’s second in command at Yorktown. A French sulfide profile portrait bust (Lot 48, Estimate: $4,000-6,000), a copy of a well-known engraved and printed Memorial work (Lot 50, Estimate: $300-500) dated 1801, a Liverpool jug (Lot 174, Estimate: $800-1,200) including Washington’s portrait and a late 19th century profile portrait bust cast in bronze round-out the offerings. 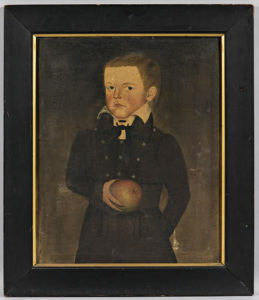 Sheldon Peck’s portrait of John Newcomb Knapp of Victory, New York, in 1838, depicted as a boy of about twelve (Lot 116, Estimate $10,000-15,000). Shown three-quarter length, John holds an apple in one hand and stands confidently with the other hand tucked behind his back. John was born into a family of accomplished individuals, and continued that tradition – he held various legal and financial posts and government appointments in a career that spanned five decades, mostly in the state of New York. Also included in the sale is a landscape painting by the New York artist George Clough (lot 117, Estimate $6,000-8,000) showing the Knapp homestead “Springside” overlooking Owasco Lake near Auburn, New York. Both paintings have descended in the family of John Newcomb Knapp. Other folk portraits include an unusually large double portrait of two children by watercolorist Jane A. Davis (Lot 318, estimate $3,000-5,000), and several works by artists in the Prior/Hamblen School. Folk sculpture includes a Large Pair of White-painted and Bellflower-carved finials that would fit well in any décor (lot 254, Estimate $3,000-5,000). 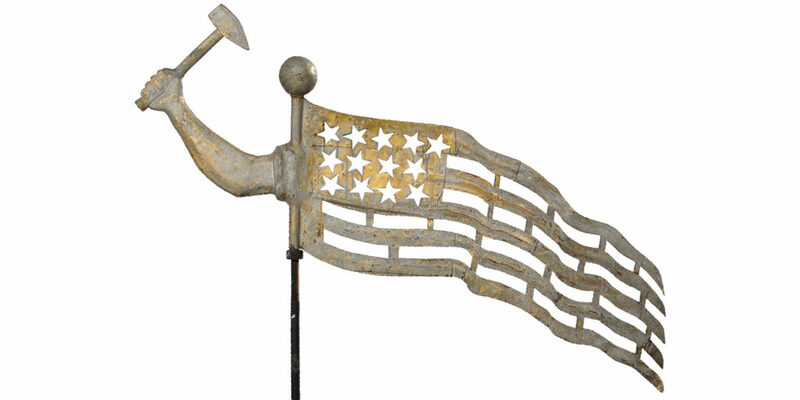 There are several weathervanes of rare or unique form, including one designed as an arm holding a hammer trailed by a waving American flag (lot 66, $20,000-30,000), a Heron (Lot 201, $20,0000-30,000) that had a place of prominence atop the Davenport mansion on Squirrel Island, Maine, near Boothbay Harbor, and a Rearing Horse (Lot 203, $2,000-3,000) attributed to Howard & Co of West Bridgewater, Massachusetts. 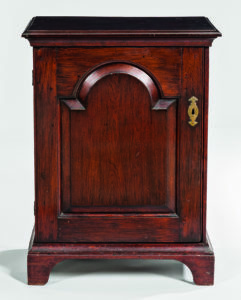 Notable among the several dozen pieces of 18th and early 19th century American furniture is a dramatically figured maple bureau made in Southeastern New Hampshire (possibly Hampstead) and dated 1817 (lot 256, estimate $3,000-5,000). An oversized Carved and Inlaid Walnut Spice or Valuables Cabinet made in Pennsylvania (lot 67, Estimate $10,000-15,000) highlights the furniture from that region, which also includes a pair of shell-carved dining chairs (lot 68, Estimate: $2,500-3,500) , two dressing tables (Lots 71 and 72), and tilt-top tables (lots 73 and 74). Furniture from Boston, New York, Rhode Island, Connecticut, and Baltimore rounds out the group. A masterpiece Shaker Basket (lot 109, Estimate: $15,000-25,000), possibly made by Sister Harriet Goodwin of the Alfred, Maine, community survives in remarkable condition including its silk ribbon enclosure tie. 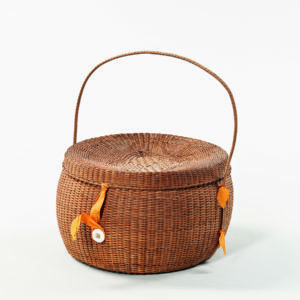 The basket is followed in the sale by a rare yellow spit box (Lot 110, Estimate: $1,200-1,800). Colorfully painted boxes, pails, buckets and other early woodenware, and a good variety of game boards and advertising items from several collections form the core of the “smalls” is this category. Country furniture with old painted surfaces and colorful design include a 24-drawer apothecary cupboard (Lot 399, Estimate: $3,000-5,000), a New York State tall case clock with painted decoration related to the work of well-studies decorative painter Rufus Cole (Lot 423, Estimate: $1,500-2,500) and a selection of work tables, stands, and chairs. Nautical antiques and Maritime paintings include a group of items relating to the 18th and 19th century China Trade: porcelain (the Society of Cincinnati tea bowl and saucer mentioned above, and others); a Portrait of the Clipper Ship Eclipse (Lot 157, Estimate: $1,500-2,500), depicts the white-hulled vessel approaching land. Other items are a small Exotic hardwood and bone-inlaid cabinet (Lot 182, Estimate: $3,000-5,000) which descended in a military family, and a variety of ship portraits by well-recognized artists. Previews for the auction will be held on February 27, from 12PM – 5PM, February 28, 12PM – 5PM, and March 1, 12PM-8PM. Free and open to the public, specialists will be on hand to answer questions. This entry was posted in News and tagged american antiques, american decorative arts, american landscape, American landscape paintings, american painting, Americana, americana auction, antique weathervanes, Chinese export porcelain, country furniture, folk art portrait, George Washington, horse weathervanes, Liverpool Jug, nautical antiques, nautical art, portrait busts, shaker antiques, Shaker basket, valuable weathervanes by Kerry Shrives. Bookmark the permalink.